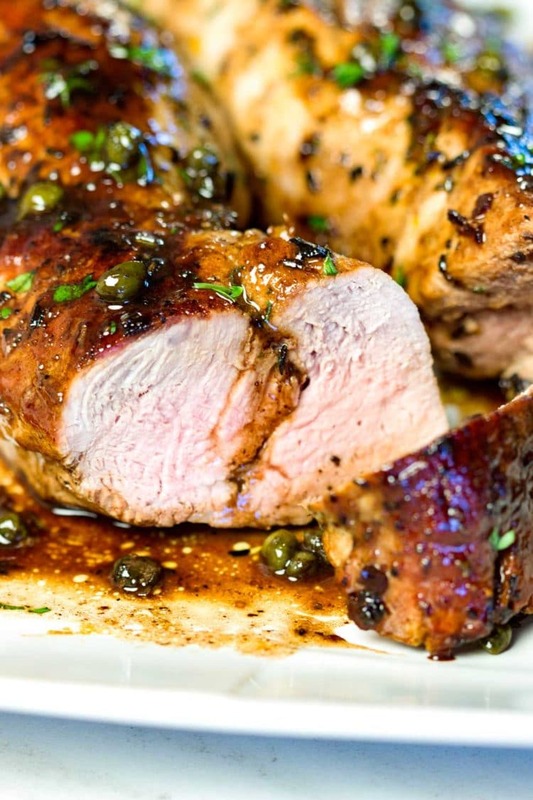 This Balsamic Roast Pork Tenderloin looks like you spent a lot of time on it, but it’s on the table in 35 minutes. Check out my new video to show you how easy this comes together! 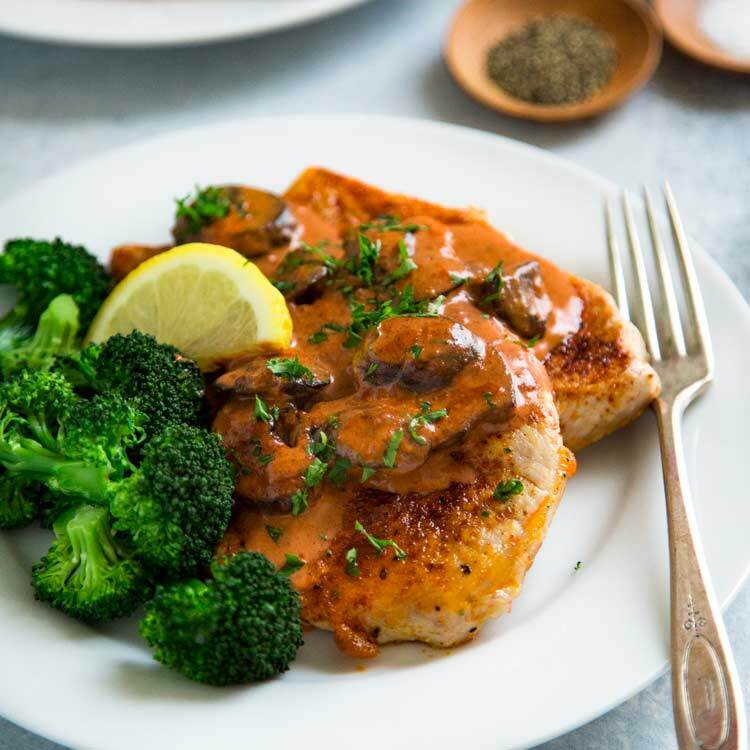 Pan seared then popped in the oven to finish off and caramelize, a heavenly balsamic and caper pan sauce finish this off for a spot on Italian influenced dinner. 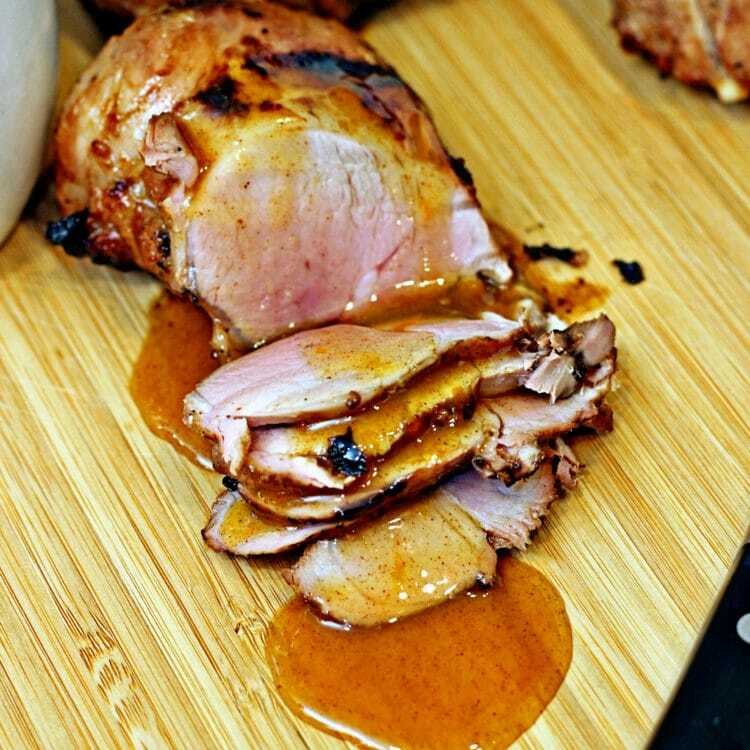 This pork tenderloin is one of those recipes that has been in dinner rotation for quite some time in this house and I can almost guarantee it will in yours once you realize how good it is, and with minimal effort. I often am asked what do I cook on a regular day? What do you guys eat? 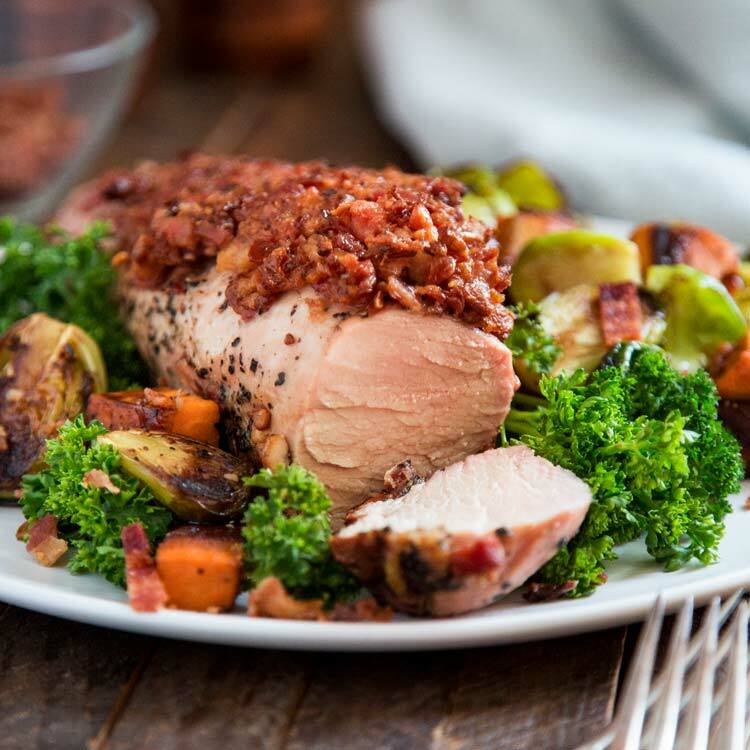 The meals are of course most of what you see here on the site, after many a taste test, but there’s also the tried and true classics like this Balsamic Roast Pork Tenderloin that I’m sharing with you guys today. A quick paste rub on the pork made up of olive oil, minced garlic, lemon zest and fresh rosemary. A pinch of kosher salt and fresh cracked black pepper and you’re good to go. Sear these pork tenderloins in a hot skillet until browned on all sides for 2+ minutes until golden brown. I love all the caramelized, crispy bits on the outside of the pork. These get popped in the oven, in the same pan mind you, to finish off cooking and in 35 minutes total you are sinking your teeth into a wonderful dinner. BUT, you gotta make the pan sauce. It’s all about the pan sauce people. Beef stock, balsamic vinegar and reduce. Add the butter, swirl to emulsify (thicken) off the heat and add the capers. Spoon over the rested pork and call me later to thank. I love capers and when I was first introduced to them it was in a Beurre Blanc at a restaurant called Piret’s. 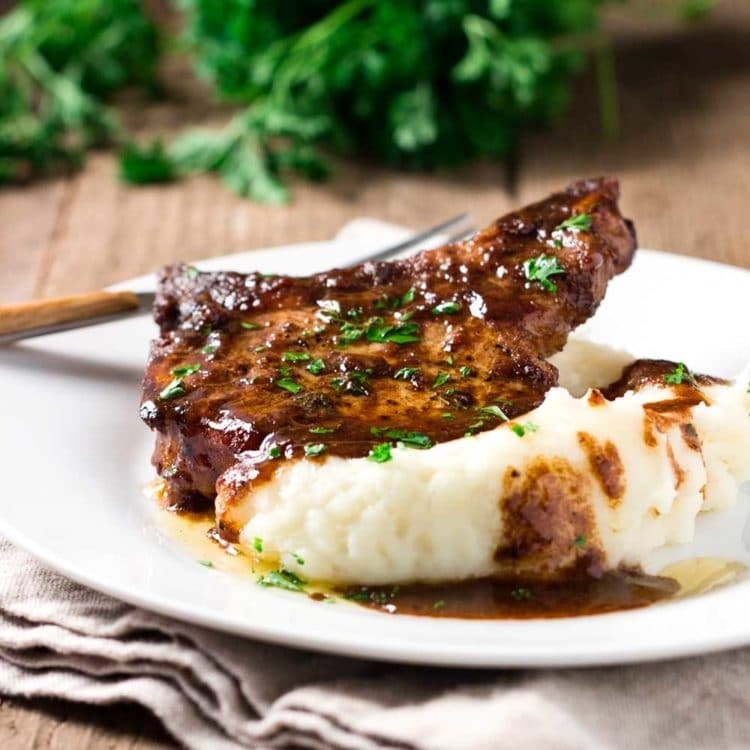 It’s a white wine and butter emulsified sauce, which really means a warm, thick butter sauce usually made with a reduction of vinegar and or white wine and shallots. I used to make a batch and dip fresh, crusty French bread in it and be in heaven. 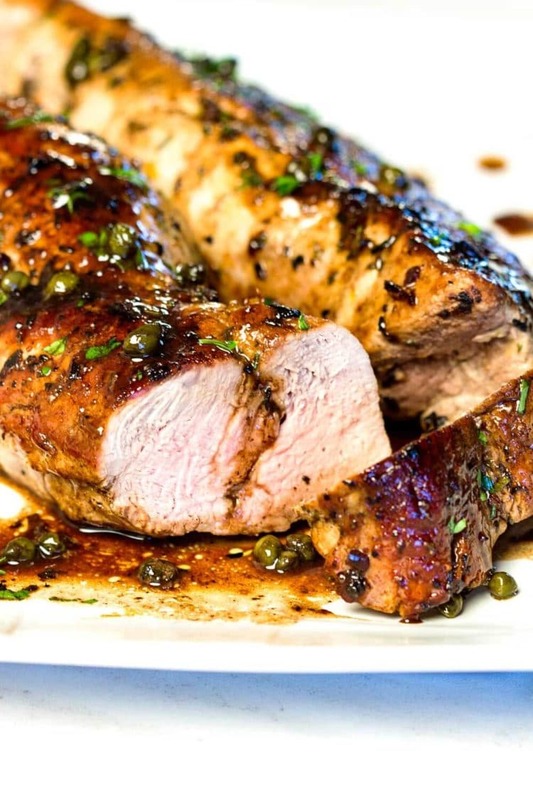 Capers are fantastic in Veal Piccata, on Lemon Chicken and this wonderful and in this flavorful pork tenderloin recipe they are a knockout. That added something! Nuanced here with balsamic vinegar, fresh herbs and lemon, it creates a wonderful palette explosion. 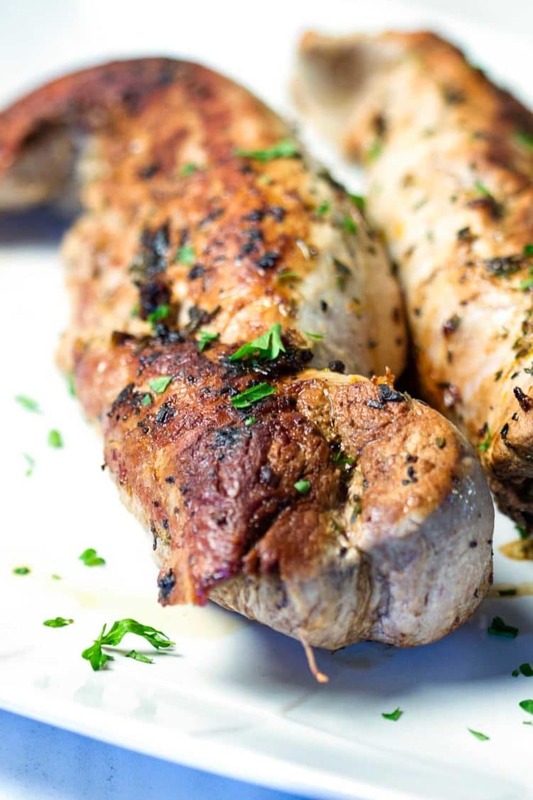 I serve this pork tenderloin with roasted vegetables or a nice salad. Don’t overcook your pork, keep it nice and moist, not dried out. Internal temp should be between 145°-160°F and allow meat to rest at least 3 minutes while your making the pan sauce. If you like pork dishes, try my Honey Turmeric Pork Cutlet with Rainbow Beet and Carrot Salad, Plantation Pulled Pork with Orange Sauce or this Szechwan Eggplant and Pork Stir-Fry. Enjoy! 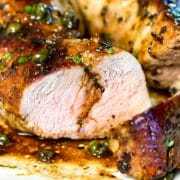 This Balsamic Roast Pork Tenderloin was previously posted back when I first started this site at the end of 2013, but has revised copy and updated photos and video. Set the pan over high heat and stir in the beef stock and vinegar, scraping up the cooked bits. Bring this to a boil and cook until reduced by half. Turn the heat off, whisk in the butter, 1 tablespoon at a time until melted. Stir in the capers and spoon over pork. Be sure t purchase a pork tenderloin and NOT a pork loin. There is a difference! 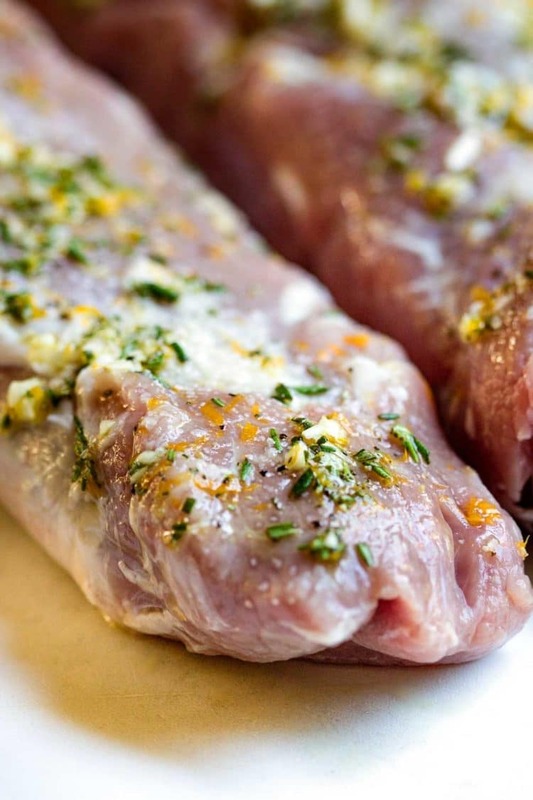 I typically, and used in they recipe, pick up a package of pork tenderloins, 2 to a package averaging 1.5 lbs each. That’s what I used here and 12 minutes was perfect. Don't overcook your pork, keep it nice and moist, not dried out. Internal temp should be between 145°-160°F and allow meat to rest at least 3 minutes. If you have a larger piece times may vary. 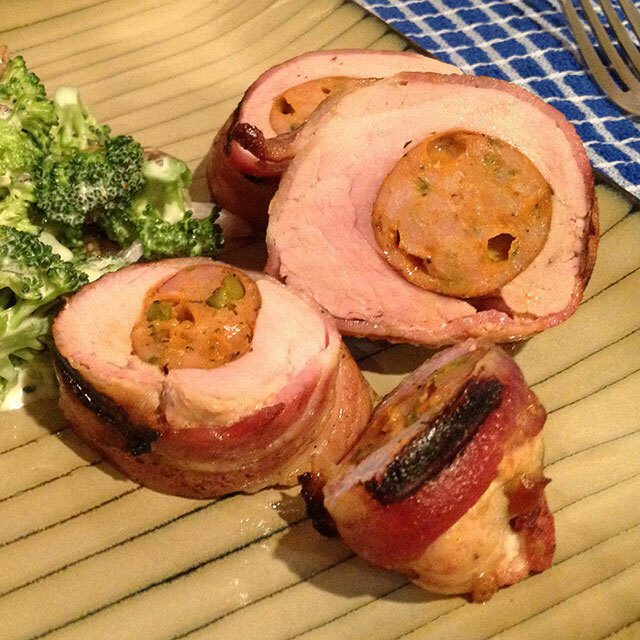 Here is a great reference on the two different cuts of pork: The Difference Between Pork Loin and Pork Tenderloins. I like to also use Meyer lemon zest, so good. It's a cross between a lemon and either a mandarin orange or the common orange. Feel free to substitute 1/4 cup of balsamic glaze for the 1/2 cup balsamic vinegar. It's already reduced and thicker. Don't overcook your pork, keep it nice and moist, not dried out. Internal temp should be between 145°-160°F and allow meat to rest at least 3 minutes. This is my newest favorite recipe!! It is so fast and easy, but tastes like you are at a nice restaurant. The balsamic sauce is heavenly. We like to make this with some creamy polenta and some sort of braised greens. I can say enough about how delicious this is. Thank you Kevin!!! Great flavor! 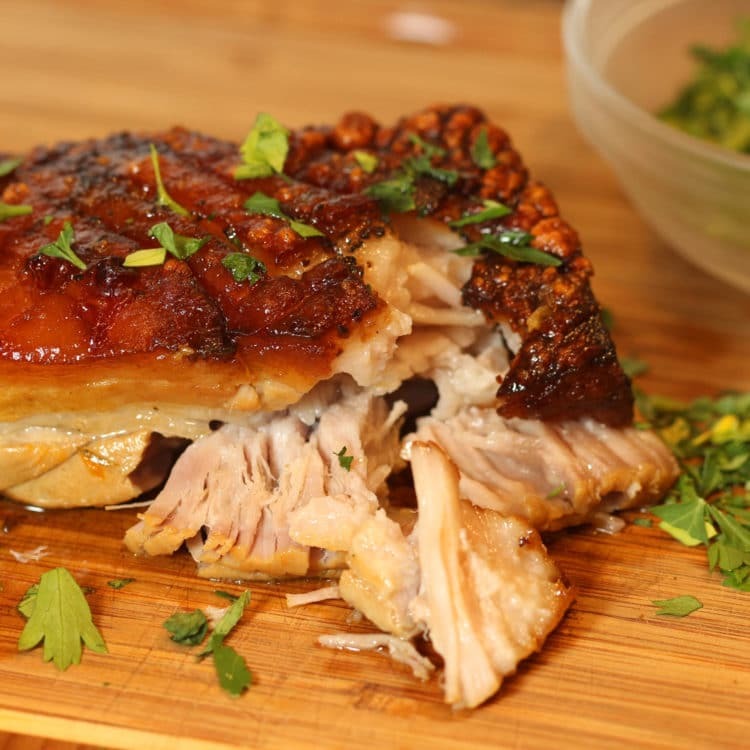 Juicy, tender pork! Quick recipe. Everyone loved it! 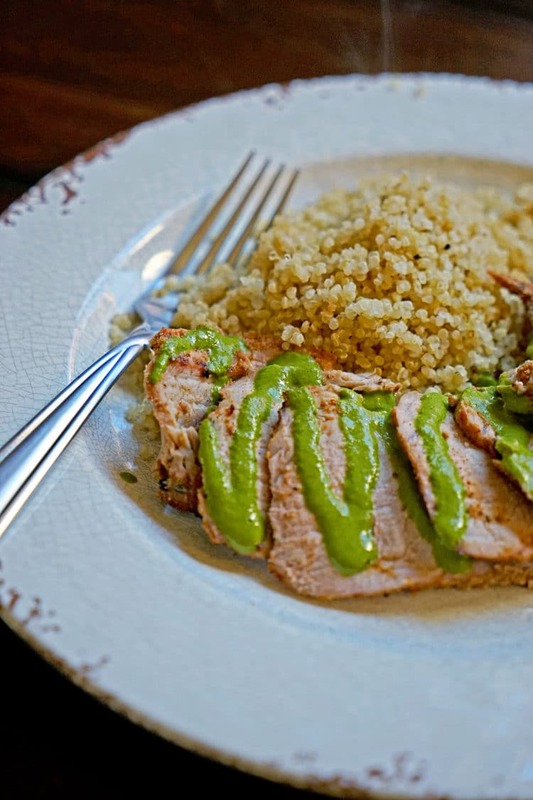 It will be my go to pork tenderloin recipe. So happy you guys enjoyed this one Gale. I love a easy recipe that delivers BIG flavor like that and this is it! Great recipe! Pork was super moist and sauce pulled everything together nicely. Thanks for helping this busy college student eat well! So happy you enjoyed this Bon. Thanks for taking the time to come back and let me know. This looks amazing, but I want to make it for a dinner party. Can I make it ahead and reheat? Made this tonight, loved it, served it with noodles and veg. Will definitely be making it again! Excellent Kevin, Well done! Only three of us so made a single tenderloin and plated it with mushroom risotto. Sauce was fantastic under both as it seeped toward the risotto on the plate. Major yum. Will add this to the dinner party rotation. Excellent, love to read comments like this Sally. Thanks so much for taking the time to come back and let me know! How long would I cook it if I the pork tenderloin is only 1.25 lbs? It would be the same time, I’ve done it myself Alice. Hi Kevin! I just bought all the ingredients and can’t wait to make this recipe. 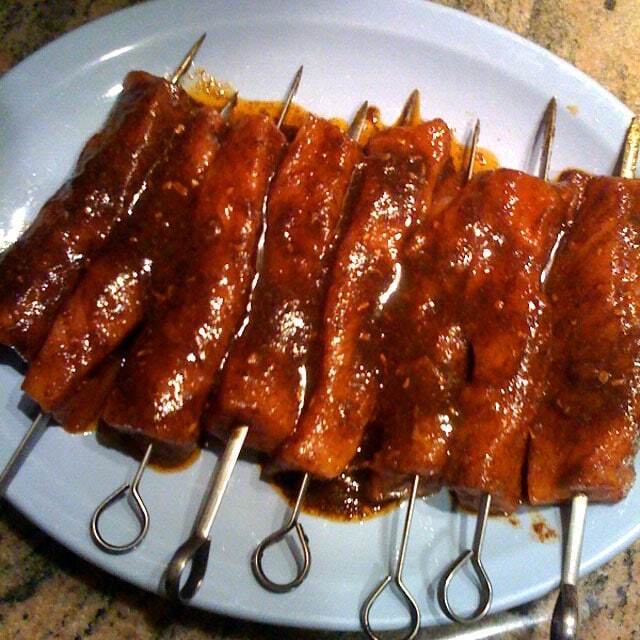 Quick question.. should I let the pork tenderloin marinade until I cook it? Thanks so much! I made it last night. It was fantastic! My 8 year old loved it too! Thanks again. Made this tonight for the second time and it was just as delicious as we remembered! Hubby LOVES it and has been requesting it for some time. We did have to roast 2-3 minutes longer (perhaps didn’t brown enough before putting in oven).. Will be making again! It’s one of my all-time favorites! Thanks for taking the time to come back and let me know Caitlin.